However much a baptized child of God may sin, he can never lose salvation. That’s the true “prosperity Gospel.” That is, as St. Peter writes, “Baptism now saves you” (1 Peter 3:21). Every now that was yesterday, and the now that ticks off today, and every now that hasn’t yet been created for us tomorrow, in every one of those moments of now, as many as you can record in a journal or diary or ledger… Baptism still saves us. Every Christian is abundantly rich through baptism. Even when our old Adam whines and begs to go back to the gutter of sinful poverty and the bankruptcy of death, the heavenly wealth we’ve inherited through Baptism remains. Why? Because the blood of Jesus is sprinkled on every dead-beat sinner who’s brought to the font. Each one washed in the blood of the Lamb. Every squealing baby and reluctant adult is named “child of God” at the Judgment Day that comes through God’s Word and water. Every dead broke, dead drunk, or just plain dead-in-sin child of Adam is picked up out of the gutter of selfish misery and hellish torment by his Savior and carried into the wedding feast of the Lamb on a flood of grace. No sin can judge nor condemn a baptized Christian except through unbelief alone. All other sins, no matter where they may be written down on Moses’ tablets, can hurt or harm a Christian so long as Spirit-worked faith in God’s baptismal promises remains. All our sin is blotted out and washed away by Word and water in the eternal now of God. That’s the truth of God’s baptismal grace. Word, water, forgiveness, life, eternal salvation, all free gift. All the riches of heaven. All given in the now of Jesus’ last word—”It is finished.”—that broke the wheels of time. No more “what should have happened yesterday” to worry about. No more “what could happen tomorrow” to chew on our nails about. In Christ, baptized into His Way, and Truth, and Life, even as our old self is wasting away, every baptized believer is daily given a new beginning and a new life in Christ through faith. 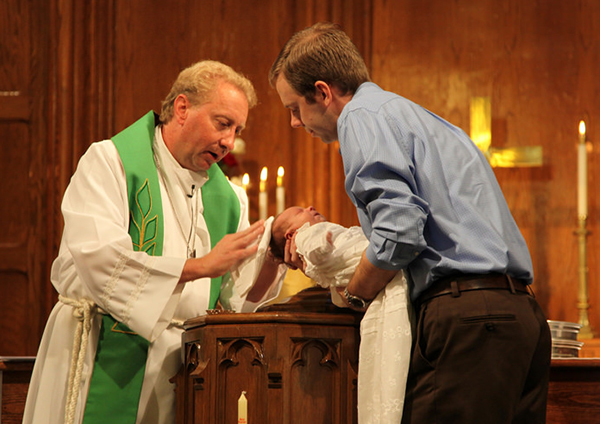 Every baptized child of God carries Christ’s Name on his head and over his heart. That’s why however much he sins, a Christian can never lose his Salvation, because God can’t deny Himself. In the waters of Baptism a Christian receives all the treasures of heaven, of all creation by grace alone through faith alone in Christ alone. He’s rich beyond any measure, because that’s the way of the Gospel. That’s the way of Baptism. That’s way of Christ and His gifts. “Christian has enough in Baptism to learn and to practise all his life; for he has always enough to do to believe firmly what it promises and brings: victory over death and the devil, forgiveness of sin, the grace of God, the entire Christ, and the Holy Spirit with His gifts. In short, it is so transcendent that if timid nature could realize it, it might well doubt whether it could be true. For consider, if there were somewhere a physician who understood the art of saving men from dying, or, even though they died, of restoring them speedily to life, so that they would thereafter live forever, how the world would pour in money like snow and rain, so that because of the throng of the rich no one could find access! But here in Baptism there is brought free to every one’s door such a treasure and medicine as utterly destroys death and preserves all men alive.” (Large Catechism, Baptism: 41-43).